Being snowed in during the last weekend in February, gave me the luxury time of going through some magazines and actually reading a book or two. I actually read the March issue of Bon Appetit on the day it came, not three months later that is most often the case. I was limited on what supplies I had on hand, but I was able to piecemeal this bread together from pantry and freezer supplies. This recipe is easily adapted to your own tastes and supplies. Place yeast in bowl of a stand mixer and add water; stir to dissolve yeast. Add cornmeal, molasses, seeds, salt, flours, and softened butter. Using a dough, mix until no dry spots remain. Using dough hook on medium speed, knead until smooth and elastic, 8–10 minutes. Lightly oil a medium bowl. (I use coconut oil.) Transfer dough to bowl and turn to coat. Cover with plastic wrap and let rise in a warm, draft-free spot until almost doubled in size, about 1 hour. Punch down dough to deflate; cover. Let rise again until about doubled in size, about 1 hour. Preheat oven to 375°. 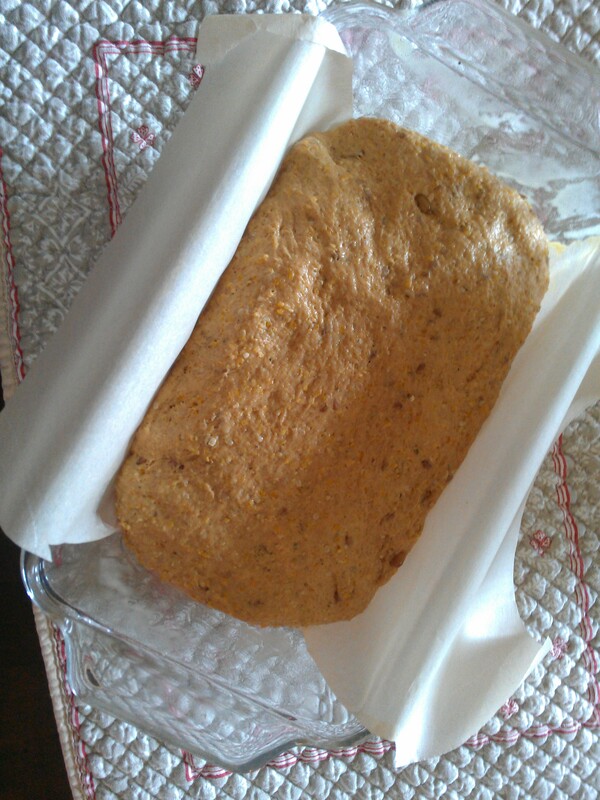 Lightly butter an 8×4” loaf pan and line with parchment paper, leaving generous overhang. Punch dough and form unto an oblong shape. Press until parchment lined pan. Let dough rise until it crests the top of the pan and springs back slightly when pressed, about 1 hour. Bake, rotating halfway through, until bread is baked through and top is a deep golden brown, 45–50 minutes. Let cool slightly in pan on a wire rack before turning out. Let cool before slicing (if you can wait that long). The next time I make this, I will add a bit of cinnamon. I love this stuff toasted! You can see King Arthur’s version and recipe here. My grandmother was named Anna and she would have thought this story was a hoot, enough so, that I am sure she would have tried the recipe just for the story alone. I hope you notice the texture of the bread. 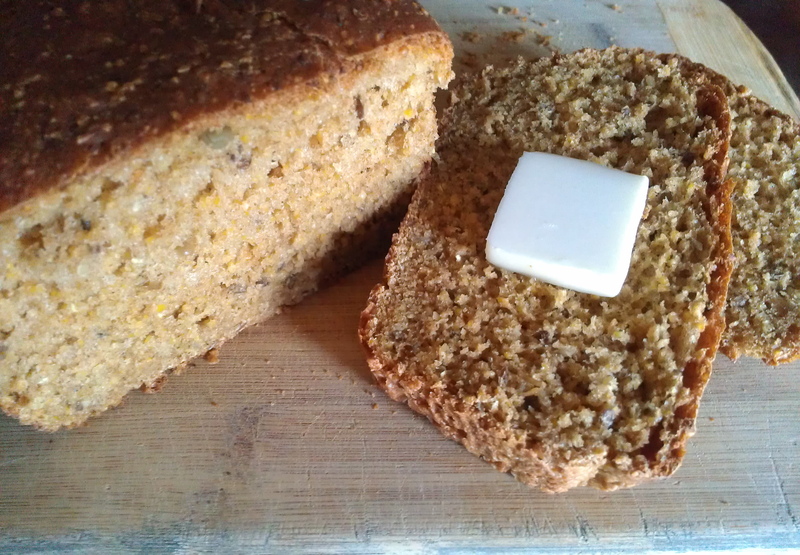 I love the feel the cornmeal and the seeds give this. Besides baking bread during my snowboundness, what did I read? 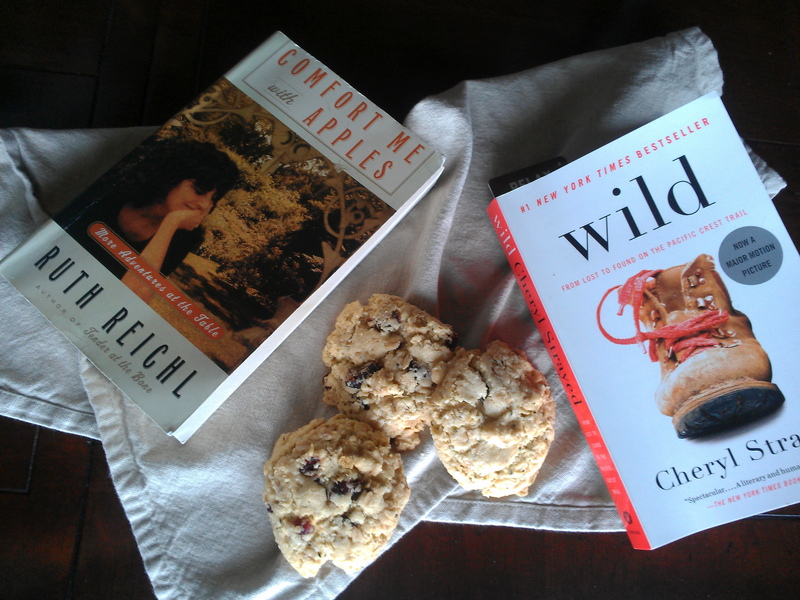 I reread Comfort Me with Apples by Ruth Reichl for our next Cook the Books Club posting and Wild by Cheryl Strayed. (I’m not sure the book is better than the movie…I need to mull over this some more.) Loved them both. I also was inspired by the hemp in this bread recipe and made these cookies. Cinnamon is penciled in for the next round of baking. 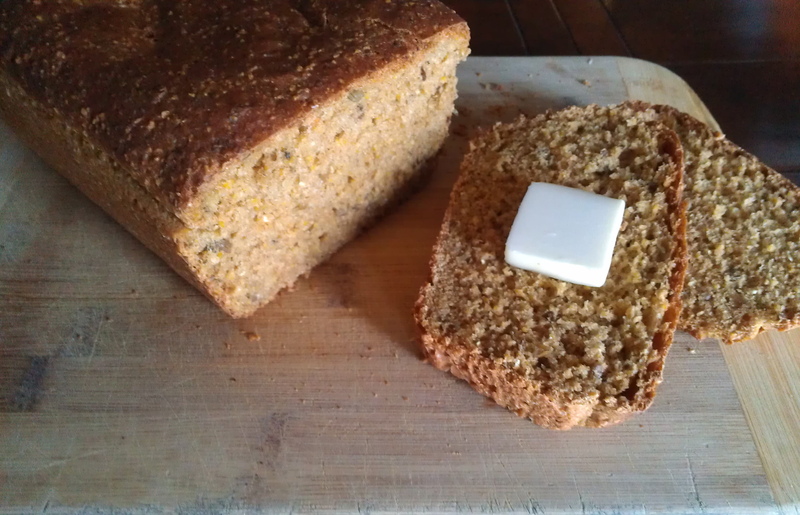 Great bread with the stone-ground cornmeal, and a funny origin. Bet it’s perfect toasted. I like Reichl and will check out the book. This book, followed by Garlic and Sapphires (closely followed by her new novel, Delicious!) are my favorites of Reichl’s book. I love recipes with stories. Especially one that involves a domestic dispute. 😉 Looks great! Hahahaha……I really know my Grandma Anna would have guffawed over this story. I saw this in Bon Appetit also and was intrigued by it. I got all the ingredients but haven’t made it yet, now I’ll have to! It makes the most awesome toast. Sandwiches? Not so much… It is a bit crumbly. Still adding it to the archives, though. It sounds like you should move to Colorado so you can be snowed in more. 😉 And I really like the story about that bread. I wish I had a warm slice for breakfast. Actually, that thought has arisen…have family in Lafayette that we would love to spend more time with. I bet you could do a much more informed post than me, Louise. This recipe was a first for me. I’m not too sure about that Debra. I think you have us covered with this post and that recipe! Haha. The Huba hates that I don’t make the same thing twice…ever…. All bread recipe should use molasses! I love this recipe not just for the molasses but for all those seeds. What a great recipe! Molasses or honey, I totally agree.